It was a poster from the Kittleson Collection on exhibit in the Minneapolis Central Library Hosmer Collection that spurred my reflections. The World War II-era posters depicts a loving mom and daughter, their gentle exchange as they plant their Victory Garden, the little girl‘s optimism as they work together to support the War effort. Peaceful, full of life and hope. Even further buried in time are the stories of the two-thirds of American moms and wives whose legacy remains unheralded. Theirs was the day-to-day life of feeding, clothing, caring for a family, often an extended family, during the war. 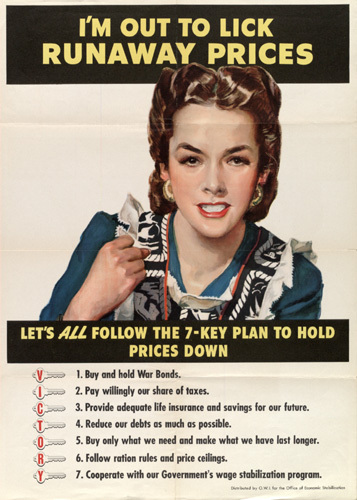 American women on the home front were valiant contributors to the War effort in subtle, domestic, ordinary ways that escape the notice of war historians and of the federal agencies that take a lead in promoting March as Women’s History Month. All during WHM I have found myself reflecting on their contributions. GH need not have worried; these ladies definitely did not resort to hysteria. And they didn’t just cope. Women became active learners – learning to garden, to cook creatively, to sew, to sell not apparel but war bonds, to operate canteens, and to do those domestic tasks that had heretofore been classified as “men’s work.” The exercised creative heroism in an environment in which tools and household basics were at a premium and the local handyman was fighting for his country. Historian Doris Weatherford writes that American women made “rationing a topic of daily conversation thereby educating themselves rapidly” largely cooking, sewing, shopping, rationing, gardening, and other getting-by tricks of the homemaker’s trade.. Rationing was both a puzzle and a mighty challenge. Food rationing was a daily reality – sugar, coffee, meats, fats including butter, fish, cheese are just some of the basics that were rationed. Substitute foods such as dried powdered eggs and liquid paraffin to replaced cooking oil were the order of the day. Meat, poultry and fish were all in short supply – even with the introduction of Spam to the American diet. Dependable refrigeration was poor and replacement was unthinkable, so most food was preserved in recyclable tin cans. Rationing also covered tires, gas, bicycles, shoes, rubber, including rubber pants, the precursor of disposables, fuel oil and kerosene. Though milk was never rationed, canned milk became the household staple for families that lacked refrigeration when steel, not milk, was rationed. Ration coupons were the coin of the realm and penalties were strict. Conservation recycling altered virtually every daily routine. Since plastic was not yet the bête noire of environmental conservation, the challenge was more basic – crushing and recycling tin cans to be turned into munitions, bottles returned to the milkman for reuse, saving cooking fat to make soap. Victory gardens were not just for the natural food purist but the basic source of produce for the family dinner table. At one point during the War fifty percent of the nation’s vegetables were grown in victory gardens. To lighten the load women created competitions for the gardens and for recipes that featured produce from the backyard of community garden. The War Production Board became the nation’s premier clothing consultant. They influenced the appearance of civilian apparel by dictating the conservation of cloth and material, changing the style, especially women’s garments. Weatherford writes that “adult clothing made its wartime adjustment primarily in the promotion of fashions that used less fabric, heedless of the implication that new fashion guidelines implied new clothes.” One story is that fabric rationing led to the design of women’s two-piece bathing suits which Neiman Marcus was quick to market as “patriotic chic” beachwear. Women also led the volunteer front. The Red Cross, the Office of Civilian Defense, serving at recreation centers and canteens, and constantly pitching war bonds were just one of women’s routine tasks. In spite of the fact that women bore the brunt of fighting the War on the home front, they had little or no say in the regulation-making process. Women ‘s involvement in the decision-making didn’t begin until the rules were in place and women were brought on board as volunteers to deal with the public and otherwise implement the rules. Though my reflections on women on the home front will continue, my goal was to make the Women’s History Month deadline. Still, I’m eager to learn more about the stories that that those posters, preserved in the Kittelson Collection, dredged to the surface. I’m now on a quest to learn more about a topic that has had such an influence on my personal life as well as the role of women. Doris Weatherford’s book, American Women and World War II, of which I read just the chapter on “The Normal Housewife in Abnormal Times” is my starting point. From there I plan to explore the rich collection of resources compiled by the librarians and researchers at the Minnesota Historical Society who have prepared a helpful guide to “Women and the home front during world war II, an excellent introduction to women’s changing role in the workplace and in the home. Save Freedom of Worship. Buy War Bonds. (1) “Rationing: Democracy’s Test” New Republic,(February 9, 1942), quoted in Weatherford. (2) “Good Housekeeping and the War,” Good Housekeeping (February 1942, p.19) quoted in Weatherford. Since 1925 Mexican children and families have celebrated April 30 El dia de los Ninos as The Day of the Child. For over a decade the day has taken on a international flavor and a bookish tone as El dia de los Ninos and El dia de los Libros have merged and grown in popularity in schools, libraries and other settings on both sides of the border. More then a decade ago Pat Mora, an enterprising Texas author of children’s books, conceived the idea of merging Le dia de los Ninos with El dia de los Libros, the Day of the Book. Her vision was that promoting the joy of reading went hand in hand with supporting the well-being of children. She suggested the idea to Latino faculty and staff at the University of Arizona who grabbed the idea and spread the word. Today, Dia celebrates children, books, Latino culture and Spanish-language children’s books wherever children and books come together, in schools, libraries, bookstores and other gathering places for young readers and their families. With the support of library colleagues, especially members of the National Association to Promote Library and Information Services to Latinos and the Spanish-Speaking (REFORMA) Dia got underway in 1997 in Santa Fe, El Paso, and Tucson. For more information on the early history of Dia click here. Today Dia is housed at the Association for Library Service to Children (ALSC), a division of the American Library Association. For individuals or organizations thinking about sponsoring a Day of the Child/Day of the Book, the resources are rich. Rose Zertuche Trevino, youth services coordinator of the Houston Public Library, offers ideas for book displays, activities and programs, and a range of multicultural activities. She includes a link to the Texas State Library and Archives Commission website, an amazing guide – including links – to music, books, ideas, art projects, even downloadable Dia bookmarks, information on the art of Mexican cut paper and much more. Simply titled Dia! another rich resource is a guide prepared by the Association for Library Service to Children. Subtitled Diversity in Action/Diversidad en Accion, the bilingual guide includes helpful hints for parents on reading and working with libraries along with a robust list of Spanish, English and bilingual books for children. Dia! also has an extensive list of websites that offer ideas for celebrating the theme “Many Children, Many Cultures, Many Books” as well as resources for bi-lingual learning. April 30 just a month away – There’s still time to build on the El Dia des ninos tradition by creating a celebration of children, books and reading. The resources are readily accessible and the observance can be a powerful – not to mention fun – learning experience for all! Note: Though this is an atypical post, it’s a way to share the message with a broader circle of individuals who know Mary Jo Richardson as a teacher, colleague or friend. It seemed the most efficient way to share a bit of good news. Mary Jo Ryan Richardson, who graduated from and taught at St. Joseph’s Academy in St. Paul, Minnesota, is the recipient of the 2013 St Joseph’s Academy Distinguished Alumna Award presented by the SJA Alumnae Association. Richardson is well remembered by SJA classmates and students alike. Mary Jo’s SJA classmate and lifetime friend, Mary Lou Klas, remembers Mary Jo as “the diplomat.” At SJA they worked together on the yearbook. The two leaders were at the forefront when the Academy made the monumental shift from blue uniforms to the stylish head-to-toe green of happy memory. The two friends went on to share leadership in college when they were elected president and vice president of the student governing body at the College of St. Catherine.. While Mary Lou spawned ideas, Mary Jo, the diplomat, worked those ideas through the system, an exercise that served Mary Jo well in her professional life. In nominating her Social Studies teacher Mary Treacy recalls “Social Studies was a lively class in my day at SJA – In part because of the era, even more because of our inspiring young teacher, Mrs. Richardson. The nation and the world were in flux – We learned about China, about famine, world religions, racial disparities and what it would be like to vote some day. Richardson’s career path included a variety of administrative and educational roles. She earned a Bachelor’s degree from the College of St. Catherine, then later in her career an EdD from the University of St. Thomas. She served as Executive Director of the Minnesota Commission on National and Community Service for several years. She was also appointed by the Governor to serve on the Minnesota State Board of Education. The Distinguished Alumna Award will be presented at the SJA Alumnae Association Spring Luncheon and Style Show, Tuesday, 10:00-2:00 on Tuesday, April 30, at Midland Hills Country Cub in Roseville. Frank Murphy’s will provide fashions for the annual Style Show. When the hour came we lived up to our promise ~ Martin Luther King, Jr.
Martin Luther King, Jr. wrote these words from Birmingham Jail a half century ago. His Letter from Birmingham Jail is a powerful reminder of how the struggle for civil rights had its start. Those who remember King’s words and who remain vigilant in defense of the civil rights for all will observe the fiftieth anniversary of King’s Letter on April 16, 2013. The worldwide observance will include public programs in libraries and museums, schools and universities, places of worship, work places, public parks, bookstores, coffee houses and anywhere people committed to justice and equality gather. Observations are scheduled for dozens of sites ranging from the Apartheid Museum and the Steve Biko Foundation in Johannesburg to Queen’s University in Belfast, Northern Ireland to a host of sites in Birmingham Alabama and in cities and towns throughout the U.S. Participating organizations, institutions, even informal gatherings are encouraged to register their participation. At this writing no Minnesota participants are listed. The global event is sponsored by the Birmingham Public Library which has posted a robust guide including links to resource materials, lesson plans, graphics participating sites and more. Today’s convergence of factors lead to sobering thoughts – of hungry children plodding through the snow with no breakfast, of the calls for acts of charity at this penitential season, and of concern to meet goal for Minnesota FoodShare Month, highlighted by a call to action issued by Governor Dayton and a project of the Greater Minneapolis Council of Churches. Minnesotans may have read or heard that food shelves throughout the state are more than ever in need of both financial and food support. Barrels are everywhere through Minnesota communities to make it easy for generous folk to drop off non-perishable goods. Food and financial drives are going full speed in houses of worship, the workplace, nonprofits and the community at large. The good news is that people are taking a closer look at why we have persistent hunger in our communities – why children go to bed hungry, why seniors have to decide between meds and food, why, in spite of the adage, waste and want exist side by side. Conversations are going beyond emergency needs to the deeper questions such as What has led us from crisis to benign acceptance of a societal travesty? How do we in a farm state balance production and consumption? Why do higher employment rates and food shelf statistics not compute? Is the right to food a human right? The media are contributing to the public discourse in positive ways. A Place at the Table, is drawing audiences and media coverage. Anna Lappe’s presentation, sponsored by Minnesota FoodShare and the Westminster Town Hall Forum, drew a SRO audience and has been requested by a barrage of MPR listeners. Local media have given time to features on hunger-related issues. The Daily Planet recently ran the Minnesota FoodShare video for their broad audience. And people of faith are heeding the words of their leaders in places of worship of every denomination, including a local adoption of Mazon, a nation-wide Jewish response to hunger. Meanwhile, at the State Capitol, legislators will have a chance to listen to the public and take action on the immediate needs. Though the imperative to fill the shelves with more and better food is a priority, it’s time to take a longer view of the underlying issues…. If not now, when?